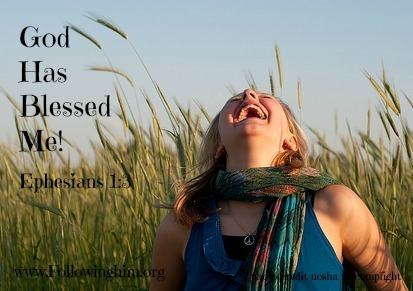 Does it excite you to know that you are blessed with every spiritual blessing in the heavenly places in Christ? My guess is no. We are so used to feeling excited by material things or circumstances or relationships. But spiritual blessings are not dependent on your health or wealth or even your relationships. God blesses us spiritually, deep in our souls, in Christ, no matter what is going on in our lives. Do you need patience? It is God’s blessing to you in Christ! Do you need more self-control? It too is God’s blessing to you in Christ! Is your life one-big-drama-filled-nightmare? Do you need peace and search in vain to find it through alcohol, pills, exercise, food, or men, but there is still no peace? Peace can be had, it is a spiritual blessing for you! Do you need power? That too is a spiritual blessing. God will not just give you a new improved version of your puny strength. No! When you need power God will bless you with His very own power, which means, achieving power making you capable and able. In fact, it is the same power He used to raise Christ from the dead, according to Ephesians 1:19-20. It is not about what I do or do not have, but about what Jesus has and is willing to give to me! Whatever you need to live out the spiritual life is given to you as a blessing by God in Christ. In other words, Jesus is all you need, my friend. And how many spiritual blessings will God give you? Every blessing! There is absolutely no spiritual blessing that you do not have access to! Me: God, please sell this house!!! I can’t take this stress much longer. God: Debbie, what will the sale of that house give to you? Me: Peace and security, Lord! God: Debbie, don’t you realize you can have peace and security in Me right now, whether or not your house ever sells? My friend, do you live under the lie that you are cursed? The truth is that you are blessed! Whatever you have need of spiritually, God will give to you. We are not promised, contrary to some teaching, every material blessing. But my dear one, you are promised every spiritual blessing in Christ and it is time to believe you are blessed! Look into the mirror today, look right into your eyes, and say to yourself, “I am blessed!” Now go live like it. Love it…I look forward to more of your blogs. Thank you, Becky! Please pray for me to write His Truth faithfully and clearly!